Grado has taken one of the world's most legendary headphones and made it even better. The SR60e has a new driver design, a new polymer to damp resonant distortion in the plastic housing, and a new cable from plug to driver connection. The way the SR60e's new driver and plastic housing move air and react to sound vibrations virtually eliminate transient distortions. This allows the signal flow over the new cable to reproduce sound that has improved tight control of the upper and lower range of the frequency spectrum, while supporting Grado's world renowned midrange. The SR60e will produce a sound that is pure Grado, with warm harmonic colors, rich full bodied vocals, excellent dynamics, and an ultra-smooth top end. Very Open Sounding,Punchy Accurate Bass, Vocals and Instruments sound very natural.Pretty Wide Soundstage. Might b a Entry audiophile headphone? :D Only Flaws might be only for its under emphasizing of bass, but nevertheless really high quality Bass. These are really great headphones for home use. Not suitable for travelling as they do not attenuate ambient noise. Great quality. Punchy, accurate bass. Mids are brought forward GRADO style. Highs are oh so sweet too. Some might believe that its too sibilant but i found it to be just nice for me. Truly audiophile headphones! These are probably the best headphones I have owned so far, build quality is top-notch. the leather is not one that looks like it will flake in a year or two. and its not like plastic that will eventually break. ear cushions being on-ear are initially not too comfortable and hot especially in a humid climate, but I eventually got used to it. I can see this lasting for a long time. Sound quality is very good, although I find the mids quite soft and may need an amplifier to drive it. bass is not as emphasizing as the way I might like it but it is more natural and makes the overall sound better. It is probably not suitable for travel due to the open back design if you are concerned about others listening to your music, I could easily hear the music from a few feet away and I thought it might disturb others. Overall, these are the best you can have in its price range. 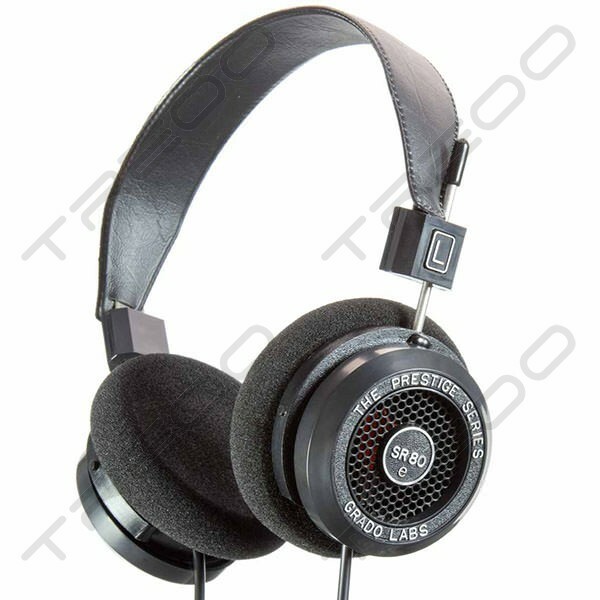 But of course, the much better ones are the more expensive Grado models. This is a very nice pair of headphones for classical music, instrumental and vocal. I paired it with the O2 & ODAC amp from JDS Labs and I was pretty amazed with the outcome. In my opinion, it sounds much sweeter than the Sennheiser HD800 for the mids and vocals when I compared the two. One might say the HD800s are in a different league but the SR80i is certainly a great performer for its price and is certainly for keeps. One thing I would change about them are the the ear pads, the ones that came with the headphones are probably not the most comfortable ear pads for the headphones. I would replace them with the 'bowl' pads soon. These headphones are pretty good considering they only cost so much. They are probably the cheapest open cans with this quality around. The bass is good and tight, but a little light. When given a boost from a good amplifier, it fares much better. The mids are clear with the vocals really coming through. The highs are really good, but considering that there is a "treble boost" built in, it's not that bad. It sounds quite intimate, leaving me wanting a slightly bigger and more airy feeling. Overall, they are pretty good with a good soundstage and value for money.